San Francisco visualisation from Connecting the City. 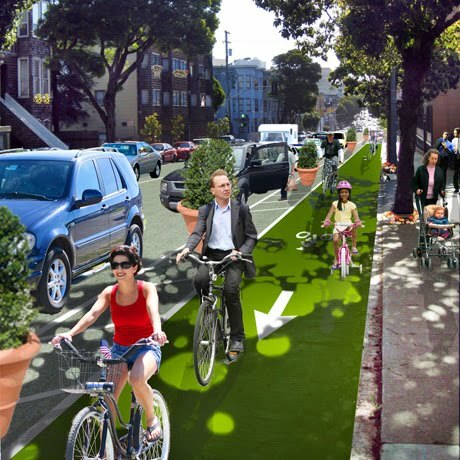 I had an email conversation with Andy Thornley from the San Francisco Bicycle Coalition and he dropped me this link to Connecting the City website about the visions for making San Francisco a more liveable city. It includes interesting visualisations of what the city could/should look like regarding bicycle infrastructure and liveable streets. Great stuff. The modal share - when asking people about commuting - is at 3.9%. Which puts San Francisco at #4 in the US. However, an SFMTA report surveyed San Franciscans as part of its 2008 State of Cycling Report and estimated that about 6% of all trips take place in San Francisco by bicycle. San Francisco is, in my mind, the Great Bike Hope for the US. Lots of positive energy, political will and visionary advocacy. The Board of Supervisors declared a new goal of 20% of trips in San Francisco by bicycle in 2020 and the Mayor has signed it so let's cross our fingers for Bikearoni - A San Francisco Treat.